The March Professional Development meeting will be held on Monday, March 5, 2018 at 6:30 PM at Google’s Washington, DC Headquarters, 25 Massachusetts Ave., NW, Washington, DC 20001. Dinner will be served. 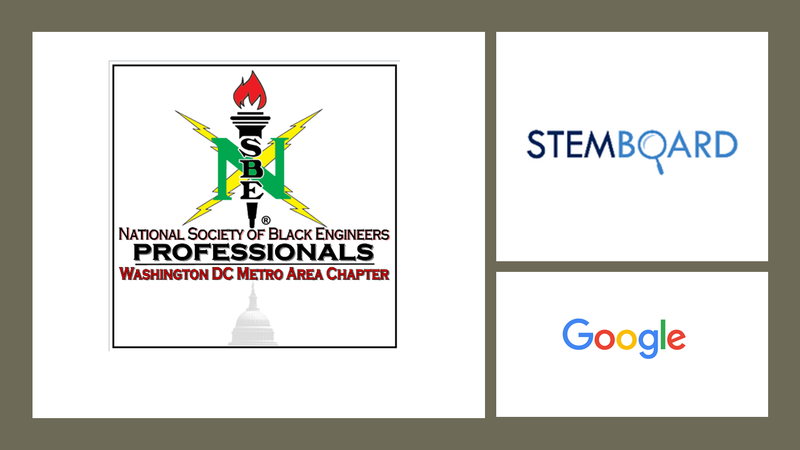 The chapter will welcome STEMBoard Inc.! STEMBoard is a certified Economically-Disadvantaged Women and Minority Small Business whose engineers and programmers have expertise in a range of technologies, from mobile web development to low-level device programming and have led innovative and disruptive change within the Federal Government. The team has spearheaded the architectures for the first tactical cellular base-stations deployed to Afghanistan, demonstrating that real-time biometric with the use of wearable devices is possible, and reducing the size, weight, power and cooling of Cloud processing by leveraging bleeding-edge stream processors. Since this is a Professional Development Meeting, NSBE DC members are free and all others are $10. An agenda will be sent out to registrants prior to the meeting. 1. RSVP by 12 PM on Monday, March 5! The Google DC office needs to have a list in advance to print badges for security purposes. THERE WILL NOT BE ONSITE REGISTRATION!!! 2. Transportation: There is limited paid street parking on Massachusetts Avenue and North Capitol. There is a parking garage below the building ($9/hour, closes at 9 pm). Arriving by Metro, Uber, Lyft, or Taxi is strongly encouraged. The nearest station is Union Station. 3. Arriving at Google DC: Enter the building and go up to the 9th floor to access the office. 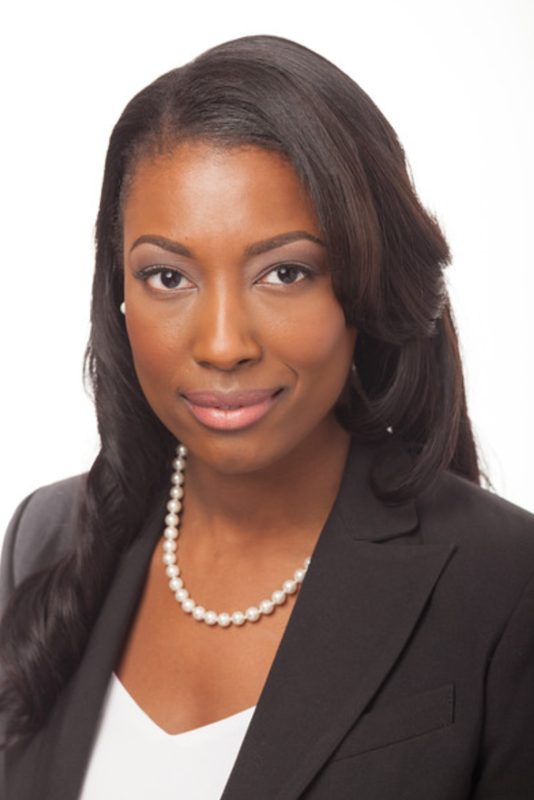 Aisha Bowe is the CEO and co-founder of STEMBoard. She leads the company’s business development and works large scale government and private sector clients. Prior to STEMBoard, she spent several years as a researcher at the NASA Ames Research Center, where she conceived and implemented programs encouraging students to pursue careers in science and technology. In addition, Aisha is a member of the NASDAQ Young Executive Advisory Board and was recently named one of LinkedIn’s Next Wave: Professionals Under 35 for her work in STEM outreach. Aisha holds a B.S.E. in aerospace engineering and an M. Eng. in space systems engineering, both from the University of Michigan. Tasha Jones serves as the Director of Programs for STEMBoard where she leads all Technology projects while fostering strong relationships with clients, while ensuring stellar client delivery of programmatic tasks. Tasha has a track record managing integrated programs for government with STG, Northrop Grumman and Harris Corporation. She holds a master’s degree in Global Management from New York Institute of Technology, a bachelor's degree in Information Technology. Dr. Jarvis Sulcer, STEMBoard’s Director of Education, is a strong advocate for education as well as a versatile and compassionate leader, educator, entrepreneur and engineer with a track record of success in for-profit and non-profit organizations. Dr. Sulcer currently manages STEM education programs in the U.S. and the Caribbean. He’s a 2017 recipient of the Digital Diversity Network Social Entrepreneurship award. A personal essay of Dr. Sulcer was also featured REACH: 40 Black Men Living Leading and Succeeding. He received his M.S. and Ph.D. in Nuclear Science and Engineering at Cornell University. Danielle Regis is the Head Instructor & Content Creator for STEMBoard. She has developed content workshops and camps that range from 1 hour to 1 week, and has taught in 5 cities and two countries. She is also building MelaninInHigherEd.com, a site that will democratize access to premier college guidance resources for high school students of color. 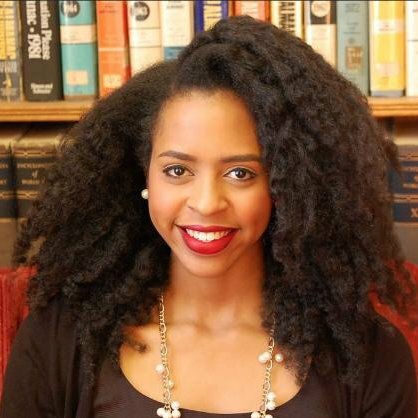 She also recently partnered with Georgetown University’s Black Student Union to create a Free College Essay Writing Workshop in Washington, D.C. Danielle is Software Developer for the Federal Government, where she is working to improve recruiting channels for collegiate students of color. Danielle holds a bachelor’s and master’s degree in electrical and computer engineering from Cornell University.